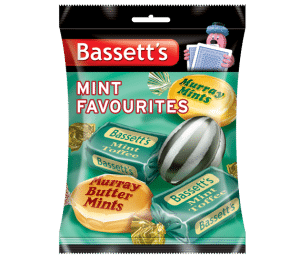 Mondelez International will be adding a mint chew, containing porcine gelatine, to its Bassetts Mint Favourites which will be landing in store this month. The mint chew will replace the mint toffee currently included in the assortments pack. The new mix will be clearly highlighted on pack with a label highlighting the new sweet, along with an image of the mint chew. The mint chew will contain porcine gelatine, and this ingredient will be clearly highlighted on the back of the pack; all the other sweets in the assortment pack do not contain porcine gelatine. Mondelez would like to clearly highlight to you that this change is taking place and would advise you share this information with your community to avoid anyone mistakenly eating this new product that now contains porcine gelatine.